While there are no major destination theme parks in Georgia (for those you could head south to Florida and visit places like Universal Orlando or Disney World), there are some big regional amusement parks (and smaller ones as well). There are also plenty of water parks, which is a great thing since it can get mighty hot and humid in the state. Water parks and amusement parks in Georgia are listed alphabetically. The Beach is a small, municipal park with a few water slides, an adventure kiddie pool, and a spring-fed lake. The facility also includes fishing, volleyball, a snack bar, soccer, softball, a bike trail, and tennis. Fun Spot America is more of a family entertainment center than an amusement park. 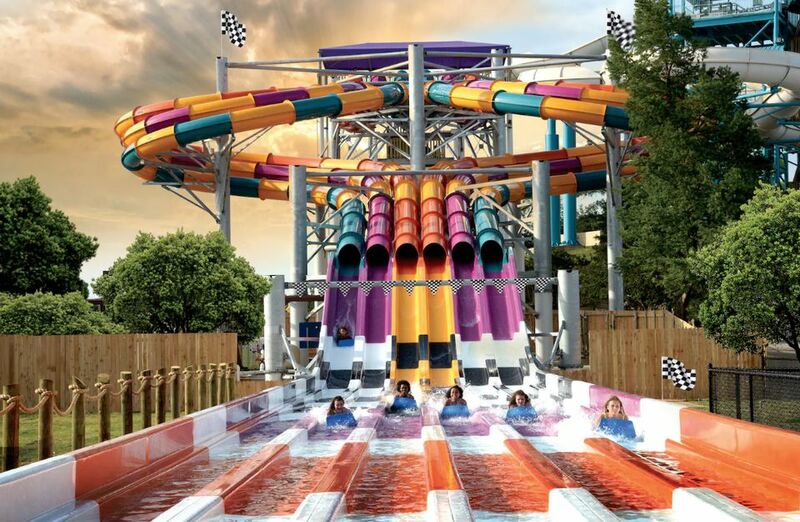 Among its attractions are the Screaming Eagle steel coaster, a Giant Swing pendulum ride, a small drop tower ride, kiddie rides, mini golf, go-karts, and a zip line. Part of the Great Wolf Lodge chain, the Georgia location includes a high-thrill slide with a launch chamber, a lazy river, an activity pool, a family raft ride, and activities for younger visitors. Admission is available only to registered overnight guests of the hotel and is included in room rates. Margaritaville at Lanier Islands includes a medium-sized water park along a lake. It features water slides, a mat-racing slide, a swimming lake, a wave pool, a bowl slide, an interactive water play structure with dump bucket, and a water play area for young children. In addition to the park, the resort includes a restaurant and bar, marina, docks, cruises, a hotel, a year-round campground, golf, horseback riding, and winter activities such as tubing, and ice skating. While the traditional lakeside park is physically located in Rossville, Georgia, Lake Winnepesaukah is on the state border near Tennessee. (The park advertises itself as being in Chattanooga.) Attractions include the Cannon Ball wooden coaster, which dates back to 1967, the Wild Lightnin' Wild Mouse coaster, lots of spinning rides, and kiddie rides. The small Soakya Water Park is included with admission to Lake Winnie. Six Flags Over Georgia is a major amusement park. It is part of the popular Six Flags chain and is one of its original branded locations. Among the park’s highlights are Goliath, a great hypercoaster, the fabulous Disney-style Monster Mansion boat ride, and the inverted coaster, Batman: The Ride. The park has a nice collection of rides for younger kids at DC Super Friends and Bugs Bunny Boomtown. The Hurricane Harbor water park is included with admission. Splash in the Boro is a medium-sized water park with water slides, a FlowRider surfing attraction, a lazy river, a wave pool, and activities for younger children. It's not a traditional amusement park, but Stone Mountain has some compelling attractions including the Lost World 4D, SkyHike, one of the largest treetop adventure courses in the country, mini-golf, a train ride, and the Summit Skyride, a gondola that takes passengers to the top of Stone Mountain. In the winter, the park offers attractions such as snow tubing and a Christmas festival. Summer Waves is a medium-sized park with a wave pool, body slides, tube slides, a speed slide, a kiddie pool, a splash pad, and a lazy river. A hybrid zoo/amusement park/water park, Wild Adventures allows entry into all three parks with one admission. Attractions include the inverted Hangman coaster and the wooden coaster, Cheetah. It also offers a nice series of live concerts, which are included with admission to the park. Looking for more fun? Here are some resources to find additional parks.